Every quarter I go over every expense I have and categorize it. This has led to a wealth of information on my own spending habits – some good and good bad. Here’s an in-depth look at what I’ve learned. Written by Adam on May 22, 2018. Updated April 24, 2019. 13 min read. Personal, Financial Independence. 11 comments. At the end of each month, I pull up Personal Capital and categorize every transaction into a category. For years before this, I was writing down every transaction as it happened – saving receipts and entering them into a spreadsheet when I got home. Tracking every single expense in this way is a lot of work. I believe it’s a worthwhile exercise to try if you’ve never done it before – even if you only do it for a month. The closer I track my spending, the less I spend. For me, it comes back to personal accountability. It’s far too easy to not look at these numbers and ignore spending, but data doesn’t lie. I’ve mentioned using savings rate as a lifestyle inflation canary, which is a handy way to see if your savings rate is changing over time. It has one major problem though – you could just be earning a bunch more each year! Tracking your spending is the one clear-cut way to understand if you have let lifestyle inflation in. Looking at the graph above, it’s clear my spending has nudged up over the past 3+ years. When I look back at my older spreadsheets (when I was single in my 20s), my monthly spending was under $2,000 a month! So what happened? Why did my spending grow so much? And what are those huge spikes? Looking at these graphs, I’m immediately drawn to ask “what was I thinking? !” when I see a huge spike. Looking into them, they’re usually long-planned expenses that just happened to be high. Luckily, I don’t have too many of them. The spikes are less scary when understood! In January 2016, Mrs. Minafi and I had just gotten engaged (Christmas 2015!). We’d already talked some about finances at that point – enough to know the broad strokes of each other’s finances. We both had been raised in families that didn’t spend lavishly – even to the point where a dinner out was a luxury. To add to that, we both went to state schools almost entirely on scholarships. When we started looking into combining finances, we decided to pay off any debt we had to start married life deby free. Since this is a debt payoff, I’d usually leave it off my expenses. I decided to track it as a “gift” since it was was before married, but if this had been paid off after we were married, it would have been left off. In October 2017 we had our biggest spending month ever. We paid for our honeymoon – a 2 week guided trip in Southeast Asia (Vietnam, Laos, and Cambodia) along with our flight there. To add insult to injury, we realized we could pay someone to landscape our house before we sold it and paid that this month too. Both of these expenses were sooooo worth it. We had a trip of a lifetime (so far) and our house was under contract within a week of listing it. In December 2017, we moved from Orlando to Salt Lake City. December was a busy month. We were paying a mortgage and rent. Plus, we’d sold most of our furniture before the move (at least the pieces we didn’t love). In December we decided to bite the bullet and get a new couch, bed set, and various other home essentials. Some were replacing things we didn’t like and decided not to bring and others were lost somewhere in the move/packing/reduction process. Looking at the spikes, they don’t worry me. They’re moments in time of extreme change. It’s OK if with change comes a slightly higher bill. If every month had that much change I’d be a lot more worried. Why is the Trendline Up? What does worry me is the trendline up. The 12 month moving average for my spending (the red line) after 2015 was $5,000 a month. At the end of April, it’s up to $7,500 a month! That’s a 50% increase in spending in 3.5 years! What happened? In 2016 we decided to start combining finances. This meant switching to one credit card for all joint purchases. We’re still getting better at this, but it did mean that everything that involved joint-money being spent would be tracked by me. I’m still not tracking Mrs. Minafi’s personal expenses. This meant things like groceries, dining out, travel and recreation all the sudden doubled. Before this, we’d both reach for the check, then pay out of our separate accounts. Surprisingly, this hasn’t been that big a difference as of yet. The spikes make a huge difference. 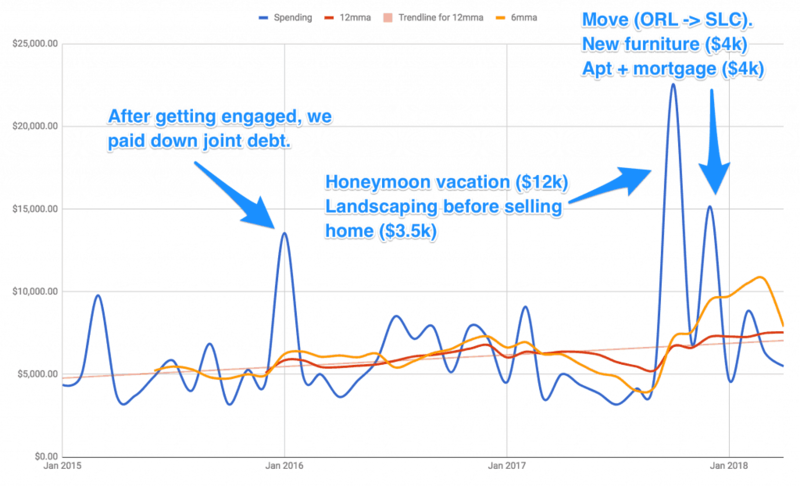 If I cut out our honeymoon, that lowers the 12-month moving average down to a 30% increase in spending over the first time period. If you know you’re going to spend money on something, might as well just spend it rather than put things off. I’ve noticed I have a tendency to spend more money on months I’m spending a lot of money. So, what have I learned from this? I’d like to say I know how to control my spending, but statistics prove that wrong. I don’t make a budget and stick to it – instead, I track spending after the fact and let it be what it is. What it is is growing. If I wasn’t living under my income, this would be a major red flag, sound the alarms problem, but because it’s still enough to save a decent amount of our shared incomes, we’ve been able to roll with these increases. When combining expenses, some categories will grow. Well, no duh. Housing remained the same – except you can’t exactly split the cost if you’ve combined finances. The difference between having roommates and having a roommate with joint finances is our single biggest expense. Having 2 cars is twice as expensive. Another no duh here. In Florida, we both drove to work every day in different directions, so having 2 cars was a requirement. In our move, we made the decision to find a place that would allow us both to commute to work without a car. It’s a little more for rent, but that should allow us to get rid of one car. I’m happy to say I’m in the process of selling my car, which should let us go down to 1 (hello ~$3,500+/yr back!). Moving is expensive. The total cost of the move for us it was around $13,000 (! ), and that doesn’t even include everything our works covered! It does include a number of things including preparing the house for sale, landscaping, paying 2 rents, buying new furniture and home accessories that weren’t worth it to ship, gas to drive across the country and more. Our works covered a lot of things (hotels along the trip, shipping our stuff and transporting a car), otherwise, that amount would easily be double. We’re good not moving for a while. I can see why more people aren’t able to afford it after this experience. The less you have, the easier this would be. Having a network of friends helps a ton. Whenever we traveled from Orlando, we would often leave Lily, our pup, with family. Since moving, we haven’t yet made the switch to see if friends could take over (mostly because we feel guilty about asking someone to do something that involves so much work). Thre are a lot of network-effect spending that can help reduce your costs. After moving out here to SLC, I borrowed a drill from Scott (I really need to return that) which saved a bunch of money on a one-time use device – along with way too much research on what “the right drill” would be. I want to look for more opportunities to share what I have now that we’re settled and in a great place in life. 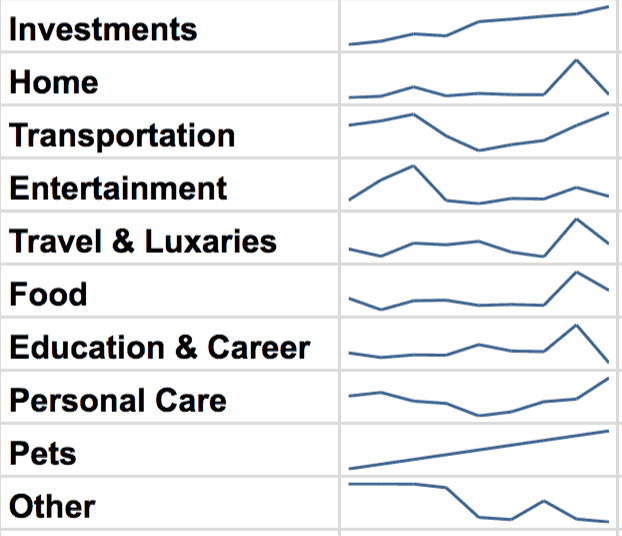 Food rises by combining expenses, but also by travel and change. On months when we travel, our food expenses are higher too. Makes sense – I tend to only eat out while on vacation. If I’m in a new place, I want to take every chance to explore, including whatever is good locally. If we’re going for the wilderness (hikes, national parks, etc) then this doesn’t apply, we can survive entirely on cheap sandwiches and meal bars picked up from the grocery checkout aisle. After our move, we ate out a bunch more while we restocked our fridge. In 2017, our restaurant spending was 1.5x higher than our grocery spending. It’d be nice to get those better in line (and I mean by spending less eating out, not just by buying more groceries 😉 ). Food costs level out if I’m able to stay on schedule. Times of the year without travel, and with a very consistent day to day, had the lowest food costs. 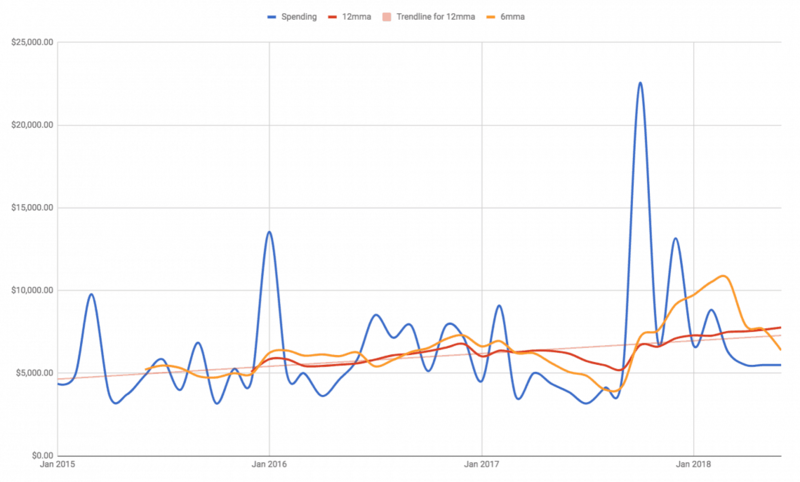 From March to September last year, we spend less than $5k/month. That’s $60k a year, but it’s closer to the Financial Independence With Options spending level I’m shooting for ($77k). Alcohol adds up fast. Although this isn’t the biggest expense, it’s shockingly high at $2,400 in 2017, and already $500 in Q1 2018. A large chunk of this has been us restocking our home bar after the move, but that’s still almost half what we spend on groceries alone (!). This is an area that by reducing we could see small gains from a money standpoint, but larger gains from a health & fitness level. Some expenses max out and stay level. While some are still variable, at least a few have been able to stay within the yearly budget for them. As long as my expenses continue to grow, I’ll never be able to know I’m FI. Part of being able to calculate that you’re financially independent relies not just on a snapshot of your current spending, but the knowledge that you’ll have enough money to make it from then on out. With my expenses growing over time, it’s unknown at this point when it’ll stop. While I could budget and attempt to spend that specific amount, I prefer to spend on what I want and let the numbers eventually level out. (that’s the theory at least – we’ll see if it happens). That being said, I do have a target spending level for every category that I set at the beginning of the year. I don’t use that as a budget, but it does guide my thoughts when I think about making a purchase. How to better account of large, one-off purchases. In 2015, I also bought a car – but didn’t put it on here. For a few months I was paying the monthly payment on it, but then realized that didn’t make sense and just paid it all off. This payment is reflected more in my investments, which saw an addition of a car as an asset, and the removal of the loan as a liability. Since this was more of a line item switch, I decided to not take it into account here. But it’s definitely something that cost me money at the time. – enough so that there would also be a massssive spike for it. For next time I do this, I’ll add a spike for the difference between what I could sell the card for immediately after I bought it and what I paid for it. Tracking Minafi Expenses. At the beginning of this year, I registered Minafi as an LLC and split off all expenses associated with it. I update them every month on the Income & Expenses page for those who love the internal side of a business. To kick things off, I put transferred $5,000 from my own accounts to a Capital One Spark Business account, and use that for anything Minafi related. $5,000 might seem like a lot, especially when the total cost of running Minafi is under $100, but this would also include things like FinCon or other blog related travel, software or hardware. This $5,000 also isn’t shown for the same reason as my car. I’m not including Minafi as an “asset” anywhere. I’m not sure I love this system, but if Minafi eventual recoups the cost it would work out that it’s not tracked. How do other bloggers budget this piece? Nothing in this evaluation came as a shock, which was both a good and a bad sign. It’s always nice when you can look at data in this way and see an obvious place of improvement, but that wasn’t quite the case here. This did confirm that the areas of improvement for our spending were exactly the areas we’ve been focusing time on improving though! Going down to 1 car rather than 2 (-$3,500+ a year). Also taking more road trips which cut down on flights, car rentals. I know I’m not the only one who tracks my spending! If you track your spending, what have your biggest takeaways been? Has it changed the way you spend money? Or unlocked areas you hadn’t realized to save money? I long for the days when I was single and my spending was sooo low. I’ve found through tracking expenses that moving in with my husband really didn’t save me any money! If anything, food costs and housing is more expensive. Yes, since you love to travel, the credit card hacking will help your budget out a ton! I know right! Moving in with a spouse seems like it would obviously lower expenses. I think it’s easier for one person to love super frugally or in a cheap apt, but with 2 it becomes a little less attractive for both parties. Definitely down for NYC! We have some family there as well. There’s even 2 things on my goals list in NYC (live there for a year and see all the live shows on broadway – which would imply I’m there every year I suppose). You’re always welcome here in SLC! Nice data, it’d be great to say eight years worth, even if the older stuff isn’t as detailed. It seems like you’ve got the budget tracking down – are you similarly tracking your progress towards FIRE? I’ve found the same as you, whether it’s money or weight loss; careful tracking changes habit. I am tracking progress to fire, but don’t have as many years doing it. I’ve only only been tracking exact account balances since 2015, but spending a lot longer. If anything tracking fi numbers has made it more clear to hold fewer funds and keep investing simple. ” that which is tracked is optimized”….. true words indeed. Great post. Eek, where’d you move from/to? My wife and I got married in 2016, and for the most part tracked our spending separately throughout our dating history and most of our first year of marriage. We each had separate Mint accounts. Last year, I set up a third Mint account and pulled all our accounts in there. It’s made it really easy to track our combined spending and also have a good snapshot of our combined net worth without having to pull from separate sources and add everything up. It’s been really beneficial. We’ve managed to cut down our combined spending by quite a bit because of the awareness raised from our joint spending tracking. Because of what you said – if you track it, you tend to improve it. Combining all of our accounts into a single Mint account was one of those things, that looking back on it, I can’t believe we didn’t do sooner. Ohh that’s good advice. We have some things that are on separate cards, but since the payments on those cards are out of our shared checking account, I see the snapshot of the total spending without the individual transactions. Going into that joint mint account sounds like a potential way to find new areas to optimize! I love tracking my net worth to see the long term changes over time. Sure, the month to month comparisons are nice, but when you really get the opportunity to stand by and see how things have changed, it’s quite eye opening. Too true! Knowledge in power when it comes to budgeting – even if it’s not always sunshine and rainbows.